On one of those days when the sun stays up as late as it can, I played a game on my office softball team. A shallow line drive, with the arc of a casual throw, came to left field, just past where the gravel meets the grass. I was playing left field, and part of my sense of duty is, well, catching any ball that I can. I dove to do that. This experience marks an incredible chapter of learning in my life, and this was my very first learning. Not, as you may think, to avoid diving. But, when diving, to avoid trying to break my fall with my non-catching hand. Running at full speed, the attempt to break my fall resulted in my hand rolling over, landing under a 155-lb human who is subject to the earth’s gravitational pull in exactly the same manner as the ball after which he was diving. 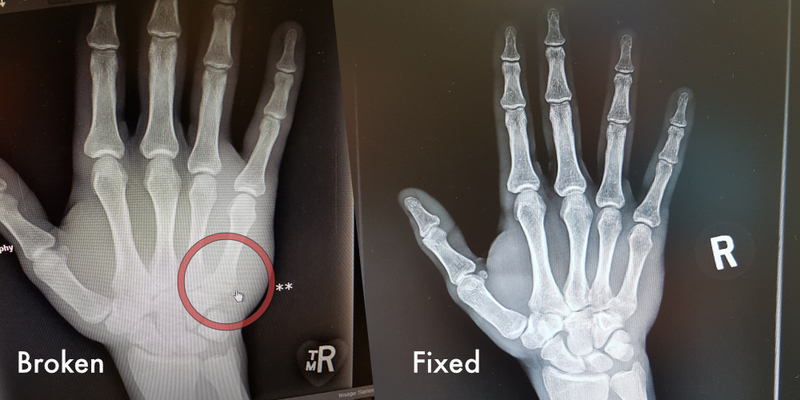 I fractured the bone in my right hand that connects to my pinky finger. The injury is commonly known as a boxer’s fracture, with a rough estimate of 4-6 weeks of splint-wearing and heightened awareness of many activities that could not happen unconsciously as long as my dominant hand was bandaged up. Antifragility – the idea that certain systems benefit from shock and disorder – is often illustrated with the broken bone which heals more strongly than it was before. As far as that goes, it doesn’t require much in the attitude of the healee to have this happen. Yet I intended to make this an exercise in antifragility for all of Jordan, not just the fifth metacarpal of his right hand. Let the Left Hand Living begin. With my right hand splinted and mostly out of commission I set about learning to become left-handed. Kept a tennis ball with me to practice throwing against the brick loading-dock wall behind our office. Brushing my teeth. Using a spoon. Writing. While a great deal of adult learning is preceded by a phase of intentional unlearning, left hand living was much easier in this respect. More often than not I had no real habits to undo; rather a bias that told me I couldn’t do such-and-such and activity with my left hand. Now, not only was that not true, but that inner voice statement became tiresome pretty quickly. This being my condition, and this being my approach for the better part of 2018’s summer, the world around me began to show itself in some remarkably new ways. Here is a collection of observations and insights from my time of left hand living. Handwriting is an incredibly intricate activity. Want to make a friend? Go to the pharmacy, spend $6 on a self-adhesive tensor bandage, and wrap up your arm. Granted, your friendship will fundamentally be based on a lie, but in my case I had something substantial to go on. I was astounded by the kindness and curiosity nearly everyone in my vicinity expressed, stranger or not. Camaraderie with other people in casts. Stories which came forth about others’ injuries. Well-wishes of healing. Sympathy for my horrible condition (which I routinely dismissed by saying I’m having a great time, often leading to a look of confusion and sometimes horror). Having an evident symbol of brokenness seems to open the door for connection in a way I never anticipated. The way I loop up my belt is a result of being right handed. After a fortnight of strange contortions to fasten and unfasten my belt, I realized I could just loop it the other way around my waist. To be fair, this isn't a design flaw of a belt as they're usually agnostic to direction (unless of course, you’re sporting a dinner-plate sized article with the state of Texas or a John Deere logo, neither of which I did). Having spent a lifetime hearing rumours of left-handed scissors I suspected these existed but never came across a set. Prior to my injury, with the hegemonic bias of right-handedness, the scissor modification seemed a fairly unimportant trifle. Most of my scissor use lasts for no more than two minutes and I supposed that having moulded handles for the wrong hand couldn’t possibly be that big of a deal. In fact, while the right-hand-moulded handles are one facet of biased scissors, even in the seemingly symmetrical designs the arrangement of the blades requires a sideways pulling motion to squeeze the blades together and get a better cut. I spent a few frustrating minutes not able to use a good pair of scissors with my left hand, not understanding that by doing the same sideways motion on the left side, I was actually pushing the blades apart. This leaves me convinced that the only real hand-agnostic scissor design is probably a knife. Playing ping pong left-handed was by no means immune from my quest for antifragility, and so after having my splint removed I was playing ping pong with a friend and decided to continue playing left-handed. But he’s a good player and was beating me badly. My life has afforded me the luxury of being able to learn a number of new skills with my left hand and not need to be extremely competent at any of them. I’m not a surgeon, not a manual labourer, and not a concert violinist. But losing so badly at this ping pong table and having a fairly healthy right hand, I wanted to play my best game. There's a time for learning, and there's a time to just play.